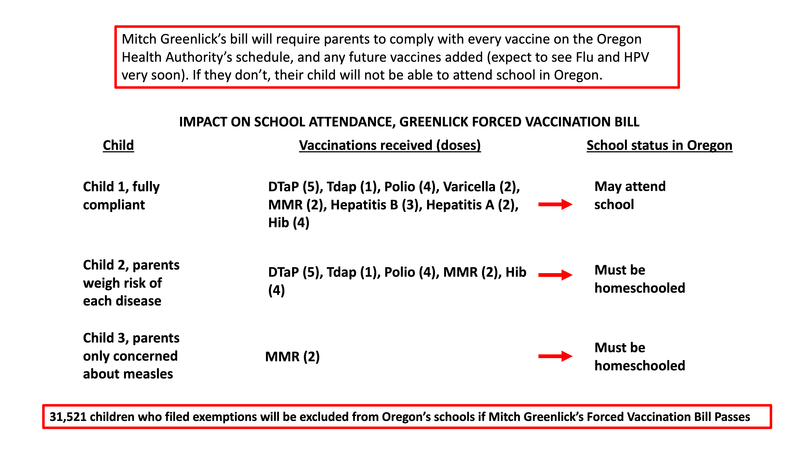 Oregon -HB 3063 will eliminate all non-medical vaccine exemptions for school attendance in Oregon (K-12, child/day care, churches with child/day care, and colleges) and prohibits "sharing space with other individuals" at any school related event or activity. Oregon homeschool associations OCEANetwork determined that HB 3063 would force homeschooled children in some co-ops to be vaccinated. This bill will impact more than 31,521 students in addition to preschool/daycare and college students and includes those with IEPs. Exempt in Oregon means the student didn’t receive ALL 31 of 31 required vaccines for school attendance. Missing even one shot - means the elimination of access public and private, parochial education and the resources of school-related events and activities. Medical exemptions will be subject to Oregon Health Authority approval. Doctors can easily be overruled. Whatever your stance on vaccinations is, this bill is a overreach of government into parents’ medical freedom to make choices on their children’s behalf. As of April 2, the bill sits in the Ways and Means committee for voting. “Our office received thousands of emails and hundreds of calls opposing HB 3063. “This legislation sets a dangerous precedent. One where parents are coerced into medical procedures or risk losing the right for their child to receive an education. By passing this policy, government is choosing to follow fear over freedom, and it is an alarming precedent to set,” said Representative Boles. Listen to this excellent recent podcast (jump to 10 minutes, just following the break). The entire second half of the interview is on discussion around HB 3063 with State Senator Dallas Heard. Thank you Senator Heard for speaking up about some of the many concerns around this bill! Two opponents, infectious diseases and a government that is so arrogant that when it looks at us as citizens it says, "we have the vote... we have the moral high ground. So it does not matter you think. We are going to do to you whatever we need to - because we think its right." Get out a history book. It never ends well when the government forces people against their will. Senator Heard points out the manipulation the pharmaceutical companies on US citizens is extensive; Opioid addiction, $400 epi-pens, Over charging US citizens by 4x the amount compared to other countries for treatment protocols. I don't understand how the pharmaceutical companies can be the kin of Satan on about every topic you can come up with except when it comes to mandated vaccines. Then they are saints all of a sudden. The CDC facts and statistics show that the trends do NOT suggest we have any kind of issue here. If anything its flat and declining. 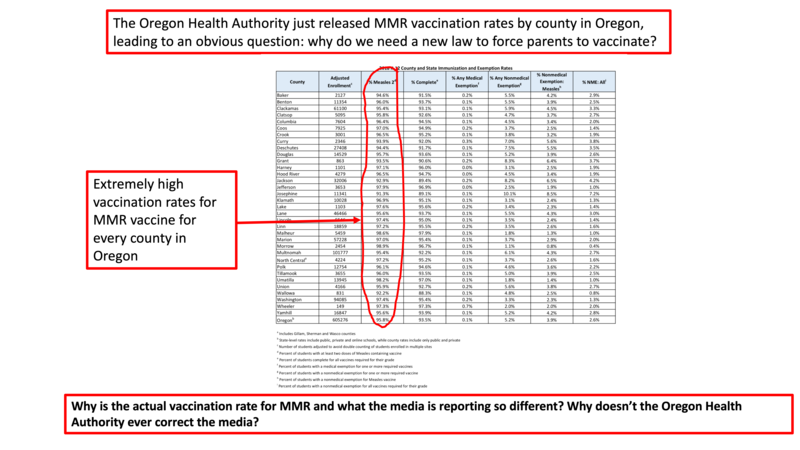 HB 3063 is being pushed by legislators who claim there is a public health emergency, when in fact, vaccination rates in Oregon have remained constant for over 20 years. Oregon has extremely high MMR rates across all counties. In 2018, 95.8% of Oregon children K-12 had two doses of MMR. The Emergency Clause is a mechanism by which Oregon legislators can prevent bills from ever going to citizens for a vote. There is no emergency. My family members have been injured and my patients have been injured. We do not yet know the precise reason certain individuals are susceptible to vaccine injury, but to say vaccine injury doesn’t occur is incorrect. Yet the pharmaceutical companies cannot be held liable for these injuries. Where is the justice in that? Making tax payers pay millions of dollars for these injuries is wrong. How can we mandate the administration of a product that may cause harm all the while making the public pay for the damage? What other industry is exempt from litigation when things go wrong? Perhaps most importantly, we must acknowledge that government is overstepping its boundaries here and interjecting itself into the private relationship of a doctor and her patient. Knowing a patient’s full medical, family and social history puts the doctor in the best position to determine how to care for her patient. Individualized medicine is what will heal our nation. But after 15 years of research, I have evidence-based, scientifically grounded concerns about the current CDC vaccine schedule. Part of that concern comes from interviewing dozens of Oregon families and medical doctors who have seen health declines in children after vaccines. People don’t realize that we’re requiring nearly four times as many vaccines as we have in the past. They also don’t realize that vaccine injury is compensated by the federal government. The vaccine court has paid out over $4 billion to vaccine-injured Americans since 1988. (source: https://www.hrsa.gov/…/vaccine-compensation/data/monthly-st…). HB 3063 seeks to bar children from school if they’re missing just one vaccine. I oppose H.B. 3063. I believe every Oregonian who takes the time to understand the nuances of this issue will also oppose it. Let’s educate the public about the importance of vaccines, not try to coerce compliance by taking away children’s access to education. All current measles outbreaks have been traced to international travelers. "US measles outbreaks are linked to travelers who brought measles back from other countries such as Israel and Ukraine, where large measles outbreaks are occurring." https://www.cdc.gov/measles/cases-outbreaks.html If the Oregon Legislature was concerned with protecting the children of Oregon, they would implement a system to safeguard against international travelers arriving with fever and illness. HB 3063 is completely devoid of protective measures to prevent future outbreaks. HB 3063 does not respect religious freedom. HB 3063 does not uphold the Constitution of the United States of America. HB 3063 does not provide a free and public (nor paid and private) education for all American children. HB 3063 does not follow the Nuremberg Code regarding coerced medical experiments. HB 3063 does not protect the education of thousands of Oregon students with a federally protected IEP. HB 3063 does not return the taxes that Oregonians are mandated to pay towards the public education that will be denied to excluded and segregated children. Join Oregonians for Medical Freedom Please oppose HB 3063. Call your local television station and request they do a fair and balanced story on HB-3063 and why it is being fast-tracked in the absence of any medical emergency. Visit your senator and representative in Salem and tell them why you support medical freedom and oppose medical mandates. If you don’t know who your lawmakers are, click here to find out. If you care about this issue, it’s time to act.